Home / Politics / KIMANI ICHUNGWA attacks ODM Secretary General, EDWIN SIFUNA, for attacking WILLIAM RUTO- You have killed ODM !! KIMANI ICHUNGWA attacks ODM Secretary General, EDWIN SIFUNA, for attacking WILLIAM RUTO- You have killed ODM !! 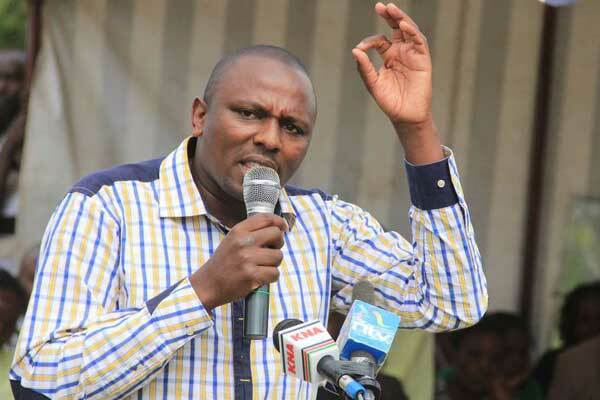 Friday April 12, 2019-Kikuyu MP, Kimani Ichungwa has attacked Orange Democratic Movement (ODM) Secretary General, Edwin Sifuna, for attacking Deputy President William Ruto. On Wednesday, Sifuna released a statement where he termed Ruto as a pathological liar for claiming that National Super Alliance (NASA) leader, Raila Odinga, approached him four times before his handshake with President Uhuru Kenyatta on March 9th, 2018. Responding to the remarks, Ichung'wa described Sifuna as "mouth-running" and accused him of destroying ODM . The outspoken legislator mocked Sifuna for having failed to clinch the Nairobi senate seat in 2017 general election, saying he has "infected" ODM with failure. "The ODM party's troubles, a mouth-running SG Edwin Sifuna who couldn’t win any seat has infected ODM with his losing habits systematically destroying the party," Ichungwa wrote on social media on Thursday. The lawmaker said with the likes of Sifuna in leadership, ODM has become a tribal outfit which is actively pursuing an outdated political ideology. "Strong political parties are good for our democracy, sorry this one is a tribal outfit still in personality cult politics," he said.